Recently, due to technical difficulties (just, you know, trivial stuff like the site not loading), I had to work some behind the scenes magic and do a minor site overhaul, which is why the site has looked different for the past week or so. Among other benefits to this change, the home page is easier to navigate, the recipe page should load faster, and – best of all – I have been reminded of the many, many forgotten recipes on this site that contain grains. Almost exactly a year ago, after about 11 billion not-quite-right batches, I posted a gluten-free banana bread recipe and, if one were being immodest here, one would admit that it was really good. But it contains the (current) holy trinity of stomach villains: oats, rice and psyllium, so I haven’t been able to have it for a long time. I’ve really missed banana bread, guys. Other than these doughnuts, I haven’t had anything even resembling the stuff in a year. A YEAR without banana bread. By anyone’s calculation, that’s too long. Whether you like yours with nuts or chocolate or straight up, you have to have it. My goal with this version was to make it better than the gluten free version, and as good if not better than the butteriest, wheatiest, sugariest loaf you can imagine. And can I just – since we’ve already put all modesty aside – toot my own horn here and tell you: mission accomplished? 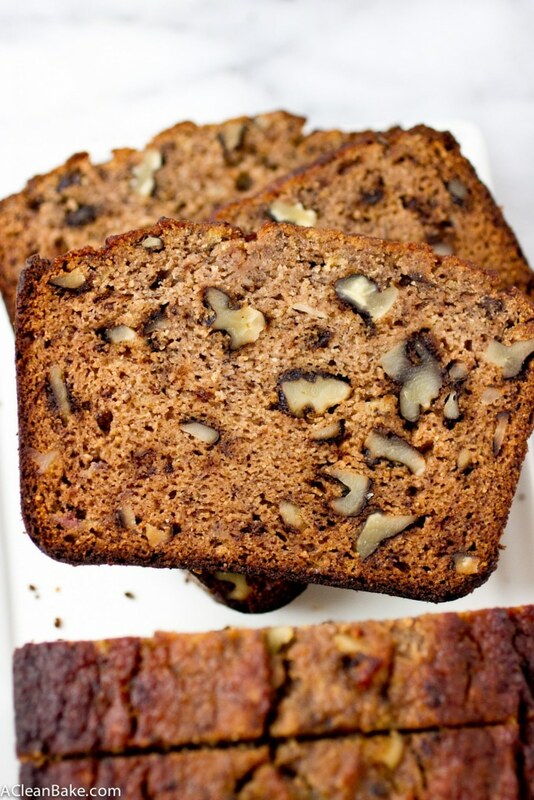 Here are my favorite parts about this banana bread: it’s soft, dense, moist and hearty. It has crunch from the walnuts, because I love textural contrast. 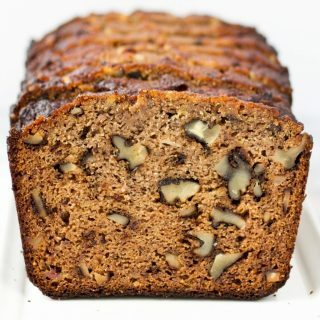 The top crust is slightly sticky in the way that the crust of a banana bread should be, just enough so that it leaves a residue on your fingers that you have to, well, get to, lick off, after you’ve finished your slice. And, best of all, you get this entire banana bread package without any compromises; it’s still grain free, dairy free and refined sugar free. So, wipe that drool from your chin and go make a batch. Or, you know, maybe seven. Just to be safe. Preheat the oven to 350F. Lightly grease or spray an 8.5" loaf pan and set aside. In a large mixing bowl, whisk together the dry ingredients (almond flour through sweetener). Set aside. In another mixing bowl, whisk the eggs until beaten, then stir in the milk, oil, vanilla and vinegar. Once all of those ingredients are incorporated, stir in the banana. Pour the wet (egg/oil/banana) mixture into the dry mixture and stir vigorously until combined. Pour the mixture into the prepared loaf pan and bake for 60-70 minutes until a tester comes out clean. Check somewhere between the 30-45 minute mark, and if the loaf is browning too fast, cover it loosely with a piece of tinfoil for the remainder of the cooking time. Allow the loaf to cool in the pan for 10-20 minutes, then turn out onto a rack to cool completely. It's best to use an oil that is liquid at room temperature. But if you prefer to use coconut oil, make sure it is melted and slightly cooled so that it doesn't cook the eggs when you mix them together. If you prefer to make these into muffins, bake at 350 for about 20-25 minutes, or until a tester comes out clean. Love the combination of almond and coconut flours here! This bread looks awesome 🙂 Pinning! OH MY GOD GET IN MY BELLY NOWWW. I can’t believe you haven’t had banana bread in over a year!!! That is serious, complete tragedy. I’m so glad you remedied that with this fantastic looking loaf! I actually had some brown bananas to use up on Sunday and made a riff on your chocolate zucchini loaf (again). So good!!! OMG I know. Don’t worry, I ate about twice my weight worth of it while I was testing (and testing and testing) this recipe. So I think my deficit has been addressed. Actually, maybe not. I’d better go have another slice. Oooh the zucchini loaf with bananas sounds great!! Obvi that means the next iteration of this recipe is going to have a chocolate base now. These pictures are making me want to face plant right into the screen! Looks delicious! I’d say follow that instinct, but that might hurt! I hope you get a chance to make a loaf of this to try though – it really is worth it! 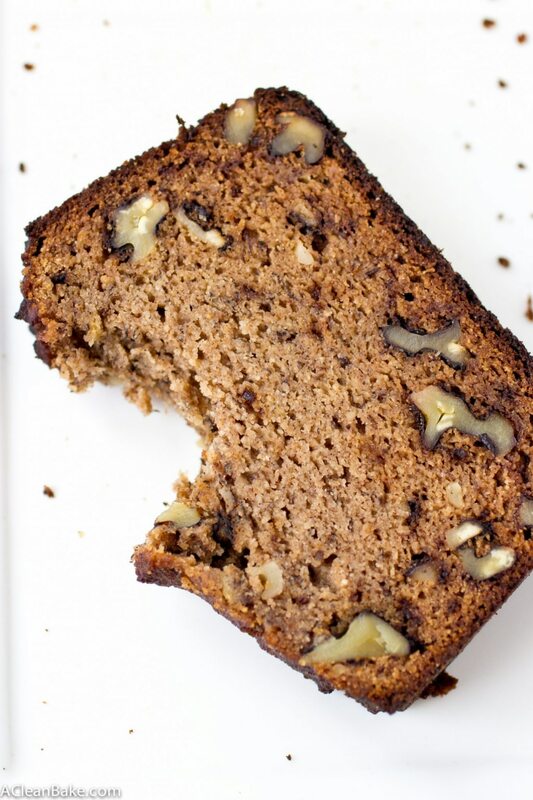 You know me and my banana bread…I have yet to experiment with a completey grain free (not even oats) type of bread but knowing how brilliant you are, I know this would be the reciep to try. Love! Oh dear, Nora. Tech issues are so frustrating ! I want to fix everything myself and when I can’t, I try and try and try until I finally hire an expert. A Clean Bake is looking good! So glad that’s behind you now… shew! My goodness Nora, this is gorgeous! The crumb, the perfect distribution of walnuts – ohMGeeeee! Love how you made this completely gluten and grain free…perfected! What a gift this is!! That top photo makes me want to do a face plant right into that mouthwatering bread! I need to get my hands on some coconut flour. Thank you for this Nora! I hope so too! Thanks, Monica! Thanks for the great recipe, we are always looking for new ways to bake grain-free. Intrigued by monk fruit sweetener, is that something we could find in any market? 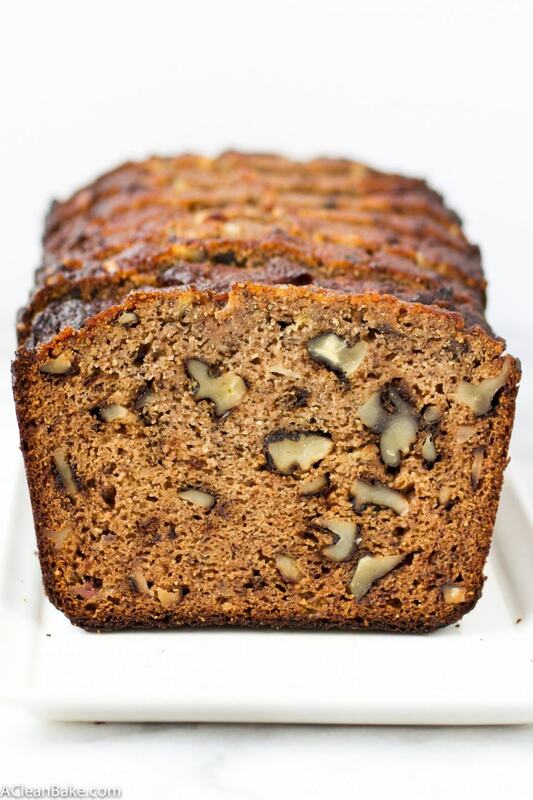 That is really a feat– banana bread without grains! Toot your horn all you want 😛 Looks fabulous too!! This is the bread of my dreams 🙂 Just saying!! Can I use regular organic sugar? And if so – what would the quantity be? Any alternative to coconut flour? 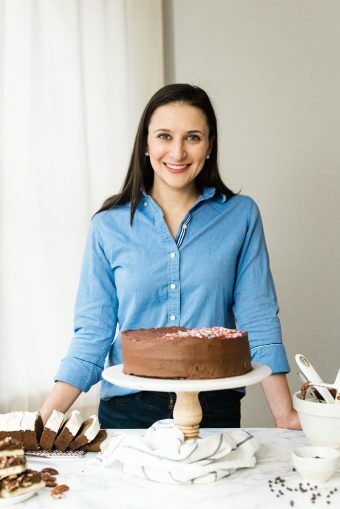 We discovered my daughter’s allergy to coconut after I made a similar recipe and she ate a bunch because it was sooooo good! Apologies, I was addressing the person who shared this with me. My daughter, with the coconut allergy – is named Nora! So, I am doubly apologetic!!! Hi Nicole! Don’t worry about it. Just yesterday someone I know called me Cora 🙂 So, I answer to pretty much anything! As for your question about the coconut flour, that’s a really tricky one. Coconut is incredibly high fiber, which helps with the bread’s structure, and it also has more absorbency than any other flour I know of. So it’s very difficult to replace in a recipe! If it were a smaller amount, I would say leave it out but it plays a big role in the structure and moisture balance of this bread. So unfortunately, I’m not sure what a suitable replacement would be and I certainly don’t want to take a guess and leave you with a failed recipe and a pile of banana mush! I use organic canola oil for this recipe (this brand), but if you prefer to avoid canola, you can use grapeseed or coconut oil. If using coconut oil, please read the recipe note about preparation – but I think the bread is better with an oil that is liquid at room temperature like canola (or grapeseed). Looks lovely!! Cant wait to try it! With what can I substitute Tapioca flour? Psyllium? Ground flax? Thanks! Unfortunately, the only sub for tapioca flour that I can confirm will work is arrowroot flour. The others you suggest would absorb way too much moisture and not be able to produce the springy, cakey consistency that you want in the finished bread. Sorry!